This year, two dozen students at Paynesville Area High School are taking a new macroeconomics class and earning college credit. Along with college-credit calculus, also added to the curriculum this year, macroeconomics supplements the college-credit English classes already offered by PAHS. All 25 students in the class are taking it for college credit through Fond du Lac Community College. The year-long macroeconomics class studies an overall view of economy, said teacher Dawn Knoll, who also teaches two semester-long economics courses. The college-credit macroeconomics class goes "a lot more in depth." 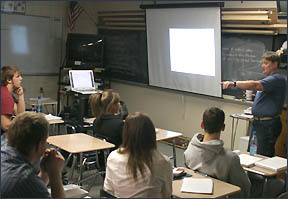 Teacher Dawn Knoll leads a morning class section of college-credit macroeconomics at the Paynesville Area Secondary School in December. Twenty-five students are taking the new class, studying overall economics, for college credit this year through Fond du Lac Community College. In early December, the macroeconomics class was still in Chapter 6; they would be in Chapter 14 if it was a semester-long class, said Knoll. So far, the class has covered supply and demand, gross domestic product (GDP), and types of economies (such as free enterprise, command, and mixed). On this day the topic is unemploymentŠfrom an economic viewpoint. One negative externality (unexpected side effect) of unemployment insurance is that - while providing a social safety net - it gives income that enables people to stay unemployed, lengthening the duration of unemployment. The research paper required for macroeconomics is "a huge step above" what is required for regular economics, added Knoll. Another good example of the work being done in macroeconomics was the research project that half the class opted to do this fall, in lieu of the paper. Thirteen members of the class participated in a Classroom of the Future contest that required them "to develop a plan that demonstrates an economically viable and lucrative business." They registered for the contest in October, submitted their business plan in November, and the winner (not PAHS) was announced in early December. Students, divided into committees, developed a business plan for a company intending to sell vitamin patches for kids. In order to make taking vitamins appealing to kids, their company would produce 36-millimeter patches with absorbable vitamins and decorated with pictures (princesses, superheroes, etc.) that kids would want to wear, like the picture band-aids for kids. They researched rent, labor costs, demographics, market strategy, and even found a machine, made in Italy, to make the patches. It cost $228,000 to purchase and another $74,000 to ship to the United States. To launch their business, they asked for a loan for $600,000. The PAHS plan scored only 10 points below the winning plan and ranked in the top third of 40 plans submitted in the state, according to Tierney Brothers, Inc., which sponsored the competition. "Your business plan and many others received were remarkable, representing strengths in imagination, efforts, and teamwork from the participating teams," stated the company in a press release. Plus, the students had to work together to create the business plan. "One thing most businesses are looking for is a cooperative-learning project," she said. Knoll was so impressed with the student's work on the project that she contacted pharmaceutical companies, including Merck and Johnson & Johnson, with the idea. Economics is a good general credit for college, students in the class agreed. "Just about everything you go into in a four-year college requires economics," said senior Cody Burr. Most of the students in the class have also taken a college-credit English class at PAHS, while only a couple were also in calculus. College credits, several students added, look good on a transcript. The extra rigor of the class helps prepare you for college, explained senior Mari Buttweiler, who took economics last year and is now taking macroeconomics for college creditŠand for the experience of doing college-level work. Even if the credit doesn't transfer from Fond du Lac Community College to wherever she goes to college, learning macroeconomics so well in high school will help her in college, agreed senior Kate Olson. "If I have to take macroeconomics (in college) because (the credit) doesn't transfer," she said, "I'm going to know it all anyway."